The supposed former owner of the papyrus, one Hans-Ulrich Laukamp, had no interest in antiquities, say two sources: the representative of his estate and a business associate. What's more, he's said to have obtained the papyrus in East Germany in 1963—a bit fishy since he was living on the other side of the Berlin Wall at the time. 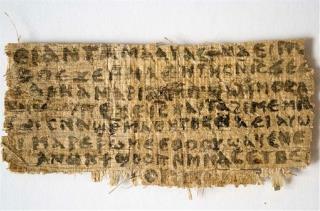 Another papyrus reportedly owned by Laukamp and given to Harvard is fake, a researcher has asserted. It looks a lot like the "Gospel," with similar handwriting and ink. Other experts are raising doubts, rather forcefully. "When is this papyrological pantomime, this Keystone Coptic, this academic farce, this philological burlesque finally going to stop?" asks a Brown University researcher. Asks another authority: "At what point do we stop claiming another lottery win and just accept that the whole thing is a forgery?" The story has started "to crumble faster than an ancient papyrus exposed in the windy Sudan," writes Jerry Pattengale in the Wall Street Journal. Specialists are saying that Harvard professor Karen King and colleagues "were the victims of an elaborate ruse," and Pattengale doesn't blame King—it's the media's "rush … to embrace the idea" that's of more concern. Click for his full piece. What difference does it make anyway if he did or didn't? It doesn't diminish anything he said or did. Why would Jesus have a wife? Wasn't he a "confirmed bachelor"?